Disclaimer: I do not have any inside knowledge concerning Oregon’s recruiting philosophy or tactics. This is merely one man’s educated take on how and why the Ducks’ performance on the football field consistently outperforms the rankings of its recruiting classes. Having gone through the recruiting process myself (admittedly at the Division II and III level), and having played with and against Division I athletes, I believe I have some degree of insight. Ultimately, though, this piece is merely an opinion. Have any of you wondered how the University of Oregon seems to consistently field a top ten football team every year without every fielding a top ten recruiting class? We can point to the facilities, to Nike, to the innovative offense and flashy uniforms, but for anyone who has played or coached the game, it’s clear that there is one overriding, universal truth: success boils down to the players. As the saying goes, you can teach a Zebra to race, but if you want to win the Kentucky Derby, you have to get yourself a thoroughbred. 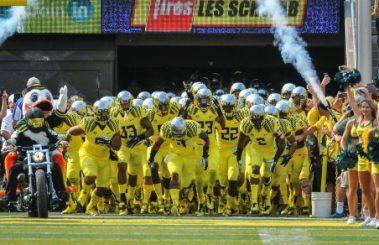 Oregon, however, consistently competes with the best of the best in college football, without having nearly the same number of incoming thoroughbreds. How? Geography. Just hear me out. The Ducks are constantly fighting an uphill battle to pull recruits to the Pacific Northwest. The Ducks’ geographic location is clearly a disadvantage when it comes simply to attracting players. What do the Ohio States, Florida States, and Alabamas of the world have in common? They are all within easy driving distance for a lot of talented high school football players. This means that a talented player’s family and friends can see him play, or come hang out on the weekends. It also means that the talented player can go home himself on weekends during the offseason. This advantage cannot be overstated. How many of you readers live within a short drive (six hours or less) of your hometown? How many of you still live in your hometown? You cannot expect a seventeen year-old athletic phenom to want to go very far from the place that has nurtured him, and now reinforces him by talking about just how phenomenal he is, and is going to be. This is simply a part of human nature to which you, I, and college football recruits are all quite susceptible. Oregon, on the other hand, is not within short driving distance of a significant number of dynamic high school football players. The state of Oregon will produce maybe one or two per year. Washington will produce a handful, and NorCal will produce a handful. By the time we start getting into the fertile recruiting ground of the greater San Francisco Bay Area, we’re a solid ten hour drive from Eugene. Los Angeles is a full two days in a car, though I’ve done it in a day. (Something I do not recommend). Oregon continues to have fun and win big despite its geographic disadvantages. The only precedent I can think of for Oregon’s success, despite a lack of access to recruiting territory, is Tom Osborne’s Nebraska teams from the 1990s. Nebraska, however, developed its program largely on the strength of an incredibly robust walk-on program unlike any operating today. Indeed, such a program is not even possible in 2015. In Nebraska’s heyday, the internet was in its infancy, ESPN provided no recruiting coverage, 247sports did not exist and social media was an imaginary proposition. Today, recruits are ranked nationally, ranked by state, ranked by region, ranked by position, and can post highlight videos to Hudl with a few keystrokes for all the world to see. If you can play, a college program will find you. That was not necessarily true in the mid-nineties. Most of the kids walking on at Nebraska twenty years ago would be receiving multiple scholarship offers today. So how, in this age of globalized recruiting and instant information, does Oregon turn its location problem into an advantage? By becoming far more thorough and far more selective. 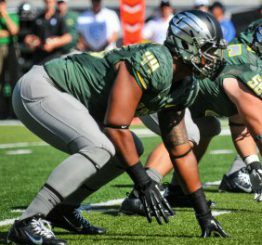 Oregon carefully evaluates under-the-radar recruits to find gems like Hroniss Grasu. We all know Oregon does not send out a barrage of offers. The coaching staff carefully evaluates players, talking to school counselors and cafeteria servers in addition to coaches and teachers. It evaluates recruits’ families, which provides insight into the values the recruits possess. It does this because its margin for error is smaller than USC’s or Florida’s. Most college football powers, by virtue of location, can send out a slew of offers to recruits, all of whom are within a relatively short drive of campus. A certain percentage of those recruits will end up signing. A certain percentage of those that sign will flame out. But the school still has seven or eight other thoroughbreds from that class ready to rock, and moreover, it is bringing in another full crop next year to replenish the stable. Oregon does not have that luxury. It cannot “miss” on recruits with the same frequency as other top-tier programs because it has far fewer thoroughbreds in its own stable. Thus, Oregon manufactures its thoroughbreds in-house by carefully selecting the right prospects in their infancy. But doing this requires a lot more work than harvesting them direct from the field. Hence the super-secret recruiting evaluation process Duck fans know, and to some extent, disdain. The evaluation process works, folks. Oregon brings in a handful of ready-mades each year, and supplements those with its own home-grown thoroughbreds to produce double-digit wins. Hroniss Grasu, Marcus Mariota, DeForest Bucker, Tony Washington, Erick Dargan—none were blue-chippers as high school seniors. But they were all outstanding college football players. 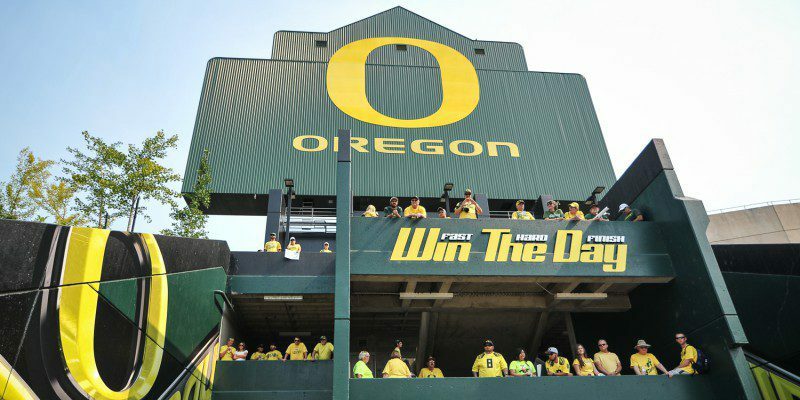 My position is that Oregon does not evaluate recruits so thoroughly because it feels that it is the only way to recruit; it does so simply because it has to. 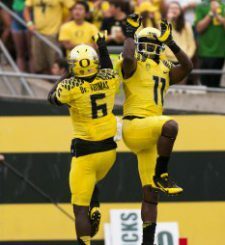 To ensure the program maintains its elite status despite geographic limitations, the Ducks must painstakingly appraise each crop of recruits, but through an evaluation process that produces home-grown thoroughbreds, Oregon has turned those limitations into an advantage. So next time you want to punch through your computer screen because Oregon hasn’t offered to your favorite defensive back out of Texas, remember: it’s all part of the plan.